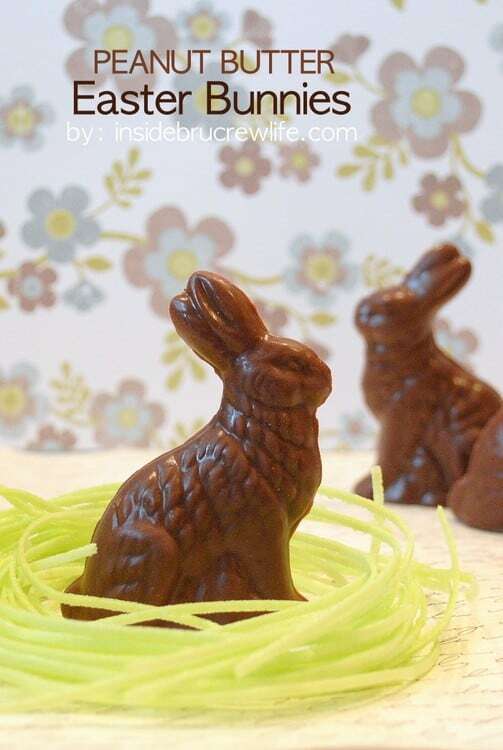 These home made Peanut Butter Easter Bunnies are a fun treat to make for Easter baskets. Why is it that as a kid things seem so much larger than what they really are? My husband just cracks up when I talk about the chocolate bunnies we used to get in our Easter baskets. I swear they were 2 feet tall and solid chocolate!!!! I don’t care how silly I sound…I still say they were that big, and I always ate them ears first!!!! They pretty much lasted a good month or more! This time of year also brings back great memories of going to my grandparent’s house for our annual Saturday egg hunt. They were the absolute best! I am not sure where they got them…but they were delicious! 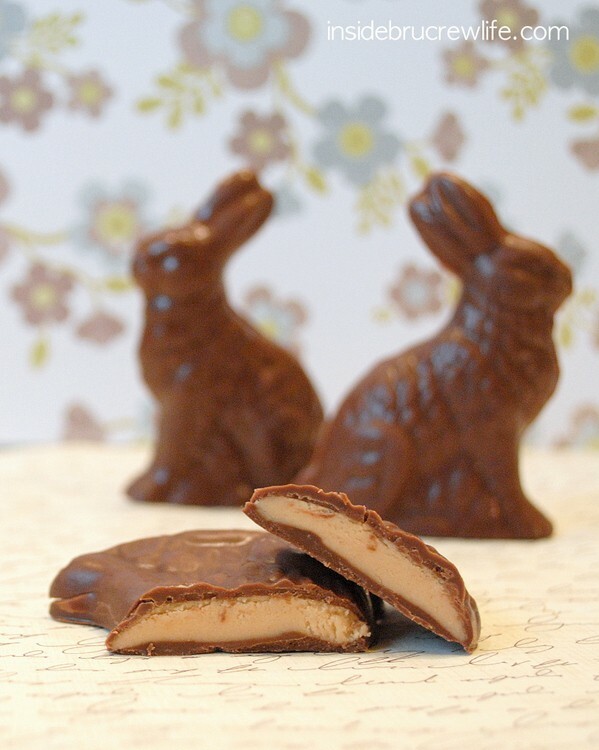 The peanut butter filling in these bunnies totally reminds me of those eggs. You know where I am going with this right? Yup, my kids are getting huge peanut butter eggs with their names on them this year. I think it is a great tradition to start up! 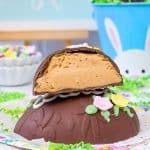 Make these Peanut Butter Easter Bunnies with a homemade peanut butter cream filling. These are so fun to fill Easter baskets with. In mixing bowl, cream butter, peanut butter, marshmallow cream, and vanilla until light and fluffy. Slowly beat in the sugar. Melt the chocolate melts according to the package directions. Paint the inside of your candy mold with chocolate. Refrigerate for 2 minutes. Check mold to see if there are areas that need a second coat of chocolate. Refrigerate again. Fill with peanut butter mixture leaving room for more chocolate on top. Spoon a small amount of chocolate over the top of the peanut butter mixture covering everything. Refrigerate until firm. Flip the mold over and pop out the bunny. *You can also shape the peanut butter mixture into eggs and freeze for 20 minutes. Then dip into the melted chocolate, set on waxed paper, and add some sprinkles. *This post contains an affiliate link. We may receive a small percentage from sales made through these links. These free referral links do not cost you anything extra. Thank you for letting us share products we use and love. 1) I would give my left breast for one of those bunnies. Now, I don’t see the PB option on the list anymore, but I know that they used to have them, and that if you bought them in the store, they’d write your name on it for you. I’m sure it’s not the exact same thing, but still, if you ever want to get nostalgic and try something similar, Sayklly’s has the BEST chocolate I’ve ever had in my entire life. Ooh those look much better than the Reese’s eggs that I am obsessed with…thanks for the recipe! 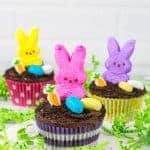 This recipe sounds great 🙂 I remember huge hollow bunnies when I was little and for some reason, I still prefer a hollow one – I like the thin chocolate that melts in your mouth! I’m sitting in an airport with people looking at me funny because I’m squealing over these. They just don’t understand!! 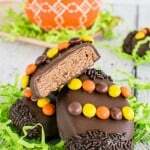 I have a question, where do you get your molds for your chocolate treats? I have looked for egg molds all over our city so I could make the homemade cadbury eggs and can’t find any. Thanks!! These look amazing! I’d love to try making these. Thanks for linking up. I’d appreciate it if you would add a link in your post back to Tasty Tuesdays so more people can join in on the fun! Looks delish! I am in such a mood for peanut butter I could eat these all up! I agree…oh no you didn’t!!!!! I have got to try this out…there goes the 3 pounds I lost last week!!!! I remember those huge Easter Bunnies and yes they were 2 feet tall!!! can you come to my house and be my personal dessert chef? haha. so great. 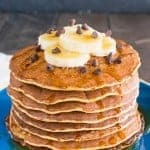 THESE LOOK SO DELICIOUS> glad I found your blog. Anyway, these look absolutely delicious! Those look awesome! You had me at chocolate and peanut butter!! They sound amazing and look fantastic! Great job! These look like so much fun and yummy. Thank you for sharing. Your bunnies are adorable!!!!! We’d love for you to come link them up. And a perfect treat for Easter. 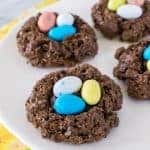 Myself and two other wonderful bloggers are hosting THIS WEEK’S CRAVINGS “Easter Cookies & Treats”. We would love for you to com link up your recipe! Hope to see you there! 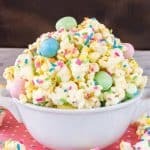 dumb question, but I’m assuming I could use melted marshmallows in this recipe. And as super amazing as you seem and as sure as I am that we would be best friends if we met, I am convinced you are set to sabotage any efforts I have to curb my sweet tooth! Peanut butter @ chocolate bunnies. A recipe straight from Heaven I’m sure! 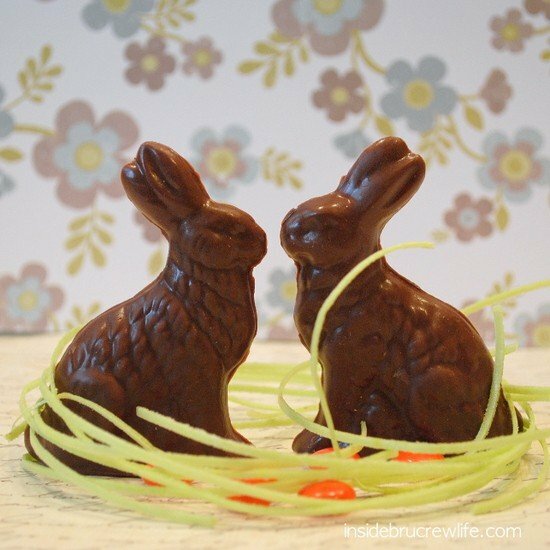 My grandparents owned Aleyeska Candy Kitchen in Anchorage, AK for many years and they had a mold for solid chocolate Easter Bunnies that was so big you couldn’t begin to finish the bunny in – even a week! 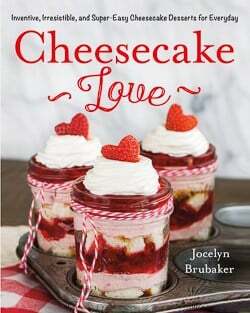 I would love to try this recipe, it looks great. However it will have to wait now until I lose some weight. 🙂 Hubby and I just started a diet…not fun! Wow! I always love to see what you come up with! These look fabulous and my hubby would LOVE then. Thanks for linking up! I’ll be featuring these tomorrow. Yum yum!!! Just saw you on the It’s a Keeper Thur. Hop! Stop on over at my blog and link up this tasty recipe in my Easter/Spring Recipe/Idea Hop! If you have others, feel free to link up! I’ll keep it going for a few months so you should get some visits from it!!! 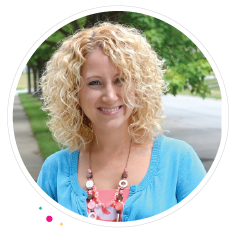 *I’m following you now on Facebook and follow your blog via GFC! They not only sound delicious, but they’re beautifully, done Jocelyn. I do some chocolatiering every year for Easter, but didn’t make any candies with centers this year. Next year, however, your bunnies are on my “must-make” list. I’ve been looking for a good PB filling recipe and yours looks like the ultimate! Thanks for keeping up the inspiration on “A Little Birdie Told Me…” at Rook No. 17! 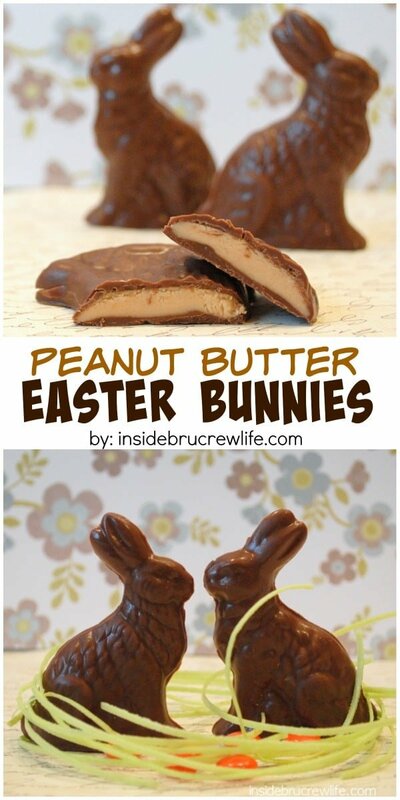 Peanut butter…I will make these even if it is not easter! It reminds me of my grandparents and growing up too! Thanks for linkg up to Making It With Allie!